An effective medium for coffee roasting? How would you measure the moisture content of a coffee bean? Recently I had the pleasure of a tour of Amoret coffee in Notting Hill. In addition to discussing an upcoming event that Amoret are kindly hosting (an evening of coffee physics, sign up to the events list to find out more), it was great to see the coffee roaster that is installed there. Fascinating, with what looks to be a really interesting series of coffees lined up ready to roast. And in the course of all this, we came upon the moisture meter, which got me thinking. Measuring the water content of green (and then roasted) coffee beans is quite critical to gaining an understanding of your roasting process apparently. Sitting on the shelf next to the roaster at Amoret, a small box contained an instrument designed for measuring exactly this. 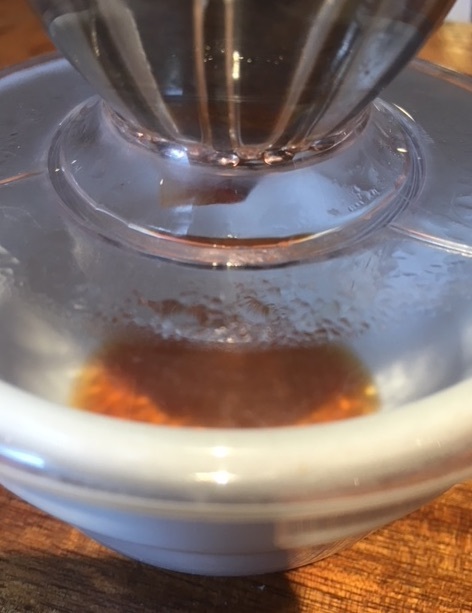 Although it looks as if it is a giant ice cream scoop with a central pillar in the middle, it is actually designed to measure the water content of the coffee beans capacitively. How does it work and, knowing how it works, can we make any predictions as to anomalous results that it may occasionally provide? The simplest style of capacitor consists of two metallic plates with a gap between them. The capacitance changes depending on the size of the metallic plates, the distance between them and, crucially for this subject, the material that fills the space between the plates. When you apply an electric field between the two plates, the electric moments of the material within the capacitor will tend to align with the electric field. Different materials will react differently depending on their “polarisability”. You only have to think about how a stream of water reacts to a statically charged balloon to see why. 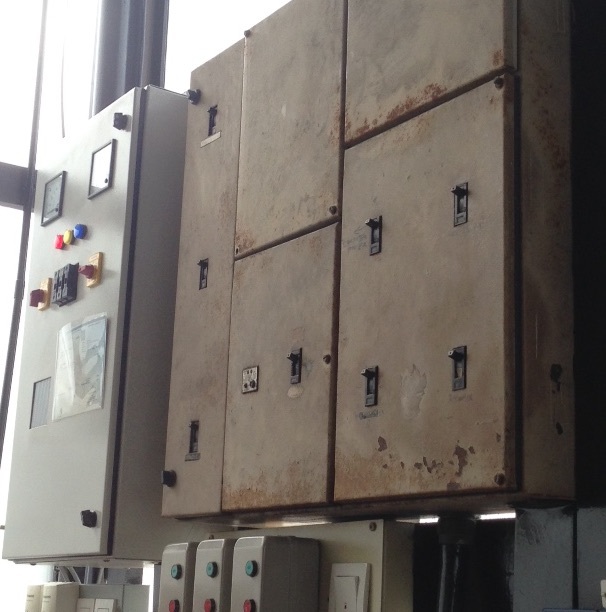 Electrical boxes in Pulp by Papa Palheta KL. The moisture meter at Amoret is much smaller than these old boxes at this ex-printing works. What this means in practise is that a capacitor formed of plates filled with water will have a different capacitance to the same capacitor filled with air. We say that the ‘permittivity’ of the air is different from the ‘permittivity’ of the water. Measuring the capacitance tells us the permittivity of the material between the plates and so whether the capacitor is filled with air or water. Now fairly obviously, it’s not quite as simple as this because a coffee bean is neither air nor fully water and the moisture meter is not two parallel plates. But in terms of the physics of the measurement, the shape doesn’t really matter here while another bit of physics called “effective medium” theory helps us with the fact that the bean is neither fully air nor fully water. Effective medium theory tells us that the relative permittivity of the mixture is simply proportional to the sum of the individual contributions from the polarisability of each set of molecules. So, merely changing the number of water molecules between the plates will change the capacitance. By knowing what the contribution of the dry beans are, we can calculate the moisture content of the coffee beans as a percentage. Or at least, the instrument can do this calculation internally and provide you with a number on the display. But. This is what got me thinking about the measurements of the coffee at Amoret. Coffee beans come in a range of sizes and shapes, as you can see by taking a look at the online selection at Amoret (here). Some of these coffees are small, tending towards a more spherical shape while some are significantly larger and more conventionally bean shaped. Is it obvious that the moisture content measured for different coffees is directly comparable? This is not to diminish the use of the moisture meter. As a comparative tool to measure before and after roasting for example, it should be a fairly good indicator. But what should we expect for the absolute accuracy of the instrument? Is a 16% moisture content measured in a small bean really equal to a 16% moisture content measured in a big bean? Do your large beans, that don’t pack well into the moisture meter, often show lower moisture contents than your smaller beans? Coffee roasting is part-science, part-art and requires great skill and attention. But can thinking about a little extra physics help to understand some of what goes on with the process? A second point is slightly more subtle. Consider that I had two beans of equal moisture content (%). But one of those beans packs more fully into the moisture meter than the other larger, more irregularly shaped bean. On roasting these beans, they both lost the same volume fraction of water so, say, they went from 16% to 12% water content on roasting. Would both beans show that they had lost the same amount of water? Do small beans that pack well into the moisture meter appear to lose more water for an optimised roasting profile than your larger, less densely packed beans? 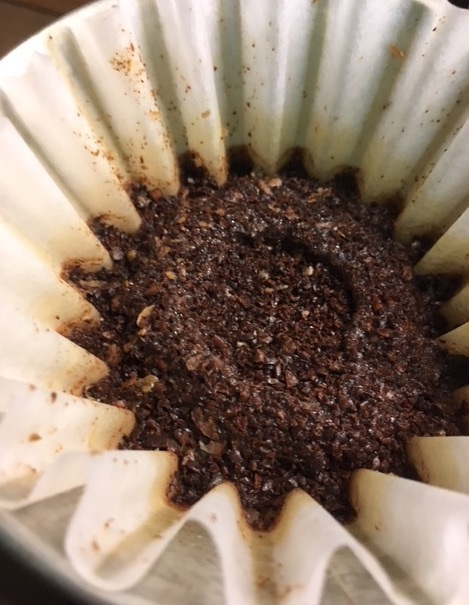 Clearly, different beans will have different moisture contents anyway and so it may be difficult to discern any pattern between two specific coffees. The moisture readings may genuinely reflect the fact that the smaller beans have higher water content or vice versa. And also obviously, the measured moisture content is only one part of determining a successful roast profile. However the question is one of statistics. On average, do your larger, less well packed beans have a moisture level lower than you expect? And on average, do they seem to lose less water (measured capacitively) on roasting? I’d be fascinated to hear your thoughts, here, on Twitter or Facebook.